Zoyland Live will be held in the heart of the village on 8th June 2019. If singing and dancing catches your eye, the festival of music will make you come alive. Our 12 hours, yes that’s right 12 HOURS of music will make enjoy yourself all day long. The event starts from 12pm on Saturday than finishes at 00.00 am Sunday morning. We have bands and singers what will perform for the whole 12 hours and make sure you enjoy yourselves for the entire time period. 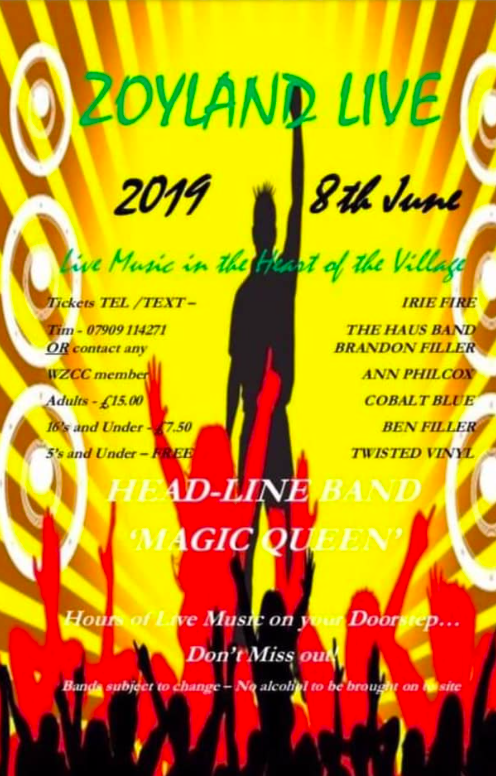 Just some of the acts we will be having: Irie Fire, Ben Filler, Arthur Shaw and our headline act one of the best tributes up and down the country, Magic Queen. The clip below will show you all of the performances that we will be having at Zoyland Live.